If you want to get better acquainted with Georgian culture you should visit the really beautiful Open Air Museum in Tbilisi. This is located west of Turtle Lake on a hill overlooking the Vake district. It is essentially a village of Georgian history, as it contains buildings moved there from all parts of Georgia. The museum was founded by Giorgi Chitaia, a famous Georgian ethnographer and academic whose name it now bears, in 1966. It is one of the most unique museums in Georgia, at which you can physically "visit" almost all the regions of Georgia in a few hours and learn about the architecture and traditions of different regions. The founder’s friends say that when Chitaia began fulfilling his dream of having a museum of this kind most of his colleagues were quite critical, but with the help of ordinary people and other colleagues who brought him material from their own expeditions, Chitaia opened the Tbilisi Open Air Ethnographic Museum after 30 years of collecting and struggling. It was the only one of its kind in the Caucasus at that time. The Open Air Museum exhibits buildings from 14 historic regions of Georgia: Kartli, Samegrelo, Adjara, Abkhazia, Svaneti, Khevsureti, Kakheti, Meskheti, Javakheti, Guria, Imereti, Racha, Lechkhumi and Ossetia. Alongside the architectural monuments the museum displays ethnographic artefacts - different kinds of tools, textile and ceramics. The museum occupies 52 hectares of land and is arranged in eleven zones, displaying around 70 buildings and more than 8,000 items. The exhibition features the traditional darbazi-type and flat-roofed stone houses from eastern Georgia, openwork wooden houses with gable roofs of straw or boards from western Georgia, watchtowers from the mountainous provinces of Khevsureti, Pshavi and Svaneti, Megrelian and Imeretian wattle maize storages, Kakhetian wineries (marani) and Kartlian water mills as well as a collection of traditional household articles such as distaffs, knitting-frames, clothes, carpets, pottery and furniture. An early Christian basilica from Tianeti and a 6th-7th century family burial vault with a sarcophagus can also be seen. In 2007 the museum was restored, with the notes of the founder being taken into consideration in this process. "It’s a pity that the houses displayed in the Museum stand by themselves,” the museum’s creator wrote, so the restorers decided to add to each house a botanical garden, with plants typical to the region of Georgia the house represents. The next thing restorers plan to do is reactivate the site's cable car for easier accessibility and this will be done at the end of April, through financing from UNESCO and the state budget. 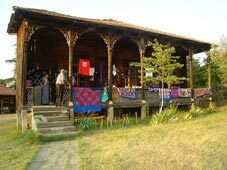 Since 2004 the museum has hosted an annual summer folk culture festival called Art-Gene, founded and run by Georgian rock musician and folk enthusiast Zaza Korinteli ("Zumba"), in which Georgians sing the songs and dance the dances of their native regions while displaying their local clothing, food, knitting, embroidery, tools and so on.